Tin Tales was an interactive installation produced in collaboration with Stacy Calvert. 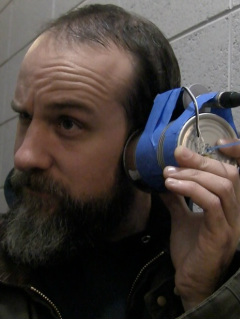 Recalling a childhood game, participants spoke to each other through tin can "telephones." 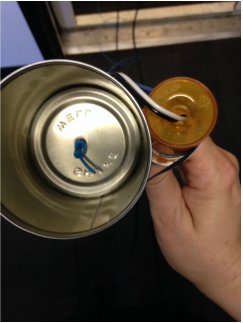 They were separated but connected by a line between the cans that they had to work together to keep taught. The telephones were amplified with contact microphones, which lent a tinny, old-time radio quality to the sound and allowed an audience to be privy to the intimate conversation. 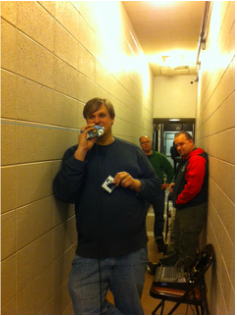 Tin Tales took place in a narrow hallway at the Communications building at Southern Illinois University, and volunteers drew prompts and told stories about school experiences while the audience squeezed into the small space to observe.